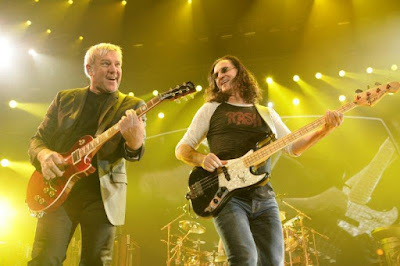 Rush bassist Geddy Lee and guitarist Alex Lifeson share their thoughts on the band’s future in a new video interview with Rolling Stone. In advance of the November 20 release of their “R40 Live” package, the pair answered a variety of questions submitted by fans, including some looking for an update on the Toronto band’s plans following what may have been the group’s final tour. "Are we going to tour again?" asked Lee. "That's the question that I'd like to know myself. I can’t answer the question because I have no idea myself but it doesn’t look good at this point. During the 40th anniversary tour, the bassist discussed Rush’s plans to scale back the length of touring as band members approach their mid-60s in the next few years, with drummer Neil Peart wishing to spend more time at home with his family in California. Asked if they will regroup to write and record new music moving forward, Lee says "We don't have any immediate plans for that. Right now we're on holiday. I hope once the new year rolls around and the juices get flowing and we get hungry again we can talk about that." Does that mean the band is definitely not done? "Not in my mind," said Lee. "But I can't speak for everyone." “R40 Live” presents Rush live in concert in their hometown of Toronto over two nights this past June.